east side bride: If these are nerds, the cool kids are in trouble. 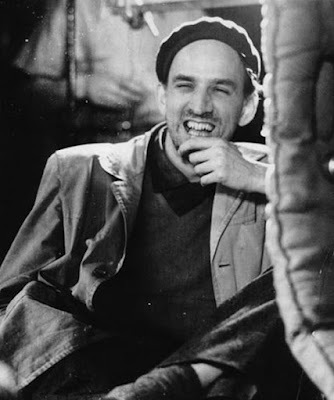 Photos of Ingmar Bergman (Film International), Suze Rotolo & Bob Dylan (Amoeba Blog), Paul Newman (Fan Pix), Pelé and Teammates (Fan Site) via Nerd Boyfriend. All credit goes to Kathryn for pointing me at this rad blog. p.s. I love the HOT sign in the corner of the Paul Newman photo. Um, yeah you are. p.p.s. Yes, Michael, the Dylan pic is for you. Nerd Boyfriend...what a fun blog! What was interesting is that the author was able to find the clothing/accessories to match the photos. My husband is going to enjoy it too. they're all so cute ... lovin' bob. ha! just made a dylan reference on flashdance in a post that has a funny story relating to you! the stars align once again my friend. good point! i LOVE both that blog and yours! You know who else needs to be added to that list? A young Dustin Hoffman ('The Graduate'). Yum. I want to jump in that photo of Paul Newman. 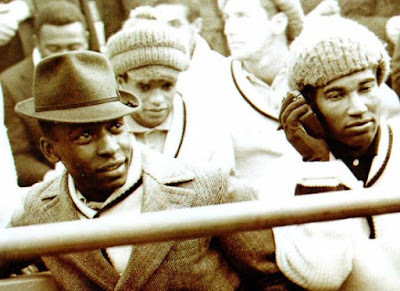 Pelé is so classy. Thanks for spelling his name right. Everyone always leaves off the accent. i'm a sucker for the nerdy style. I am lovin these shots, I am all about the nerd style. Ditto on the sign near Newman! Your advice is always solid, lovely lady. My wedding would be sh*t without you. Seriously. Ok. Not sh*t. Just dime store tacky. You know what I mean, yo. 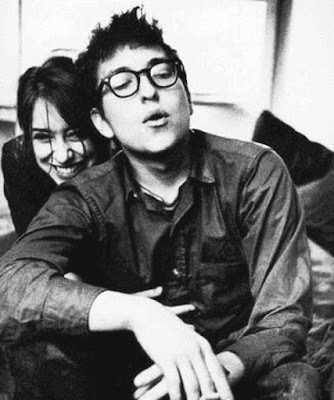 I saw Suze Rotolo read from A Freewheelin' Time and it is so, so apparent why Dylan fell in love with her. 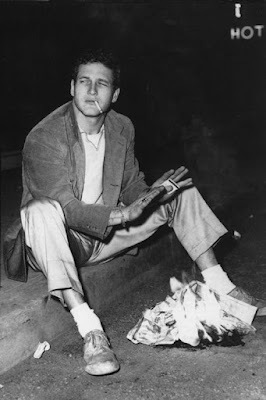 I miss Paul Newman, and boy... "hot" is the right word!! !